A hybrid function generator design: TEGAM combines the best of both worlds in signal generation: the low cost, ease of use, and sweep/modulation capabilities of the Direct Digital Synthesis (DDS), function generator architecture and the unprecedented accuracy and precision of a true arbitrary waveform generator. 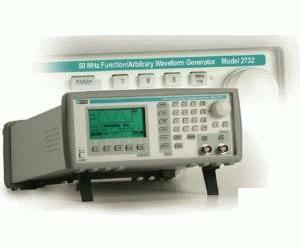 Create and generate high-speed, standard, or user-defined waveforms ranging from 1 µHz to 50 MHz. Any of the 2700A series is ideal for replacement of traditional function, sine, pulse, or sweep generators with the addition of true arbitrary waveform capabilities. These units outperform other function generators by offering core design advantages including 14-bit vertical resolution, up to 4 M points of segmentable RAM, 0.01 S/s-125 MS/s sampling, programmable sync pulse, sine waves to 50 MHz, sweeps from 10 ms to 500 s, internal/external modulation, and more. WaveWorks DDS™ waveform creation software, which is included at no additional cost, offer graphical tools to allow the creation and customization of virtually any waveform type.